You Are Here: Home » Rules of Table Tennis » Can you volley the ball? 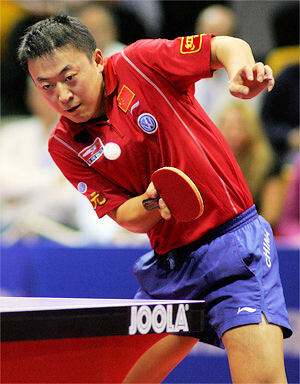 One table tennis rule refers to volleying the ball. So is volleying the ball allowed? One of the table tennis rules which you'll need to be familiar with is the rule which deals with volleying the ball. Volleying means intentionally or unintentionally hitting or touching the ball before it bounces on the table or goes out of play. Previously, if a player volleyed the ball at any time he lost the point, but the rules were subtly changed in the 1990s, so now it depends on the circumstances. Volleying the ball is covered by the "obstruction" rule, so we'll examine what the rule says and it's purpose. So let's take a look at this rule and discover what is allowed and what's not allowed. So what does the current rule say? "A player obstructs the ball if he or she, or anything he or she wears or carries, touches it in play when it is above or travelling towards the playing surface, not having touched his or her court since last being struck by his or her opponent." The crucial test for whether a player wins a point after his opponent has volleyed the ball is ... was the ball moving towards, or away from, the playing surface when it was volleyed and/or obstructed? "If I hit a ball to my opponent, and it doesn't hit their half of the playing surface (table) because it's a bad shot ... but they hit the ball anyway, who gets the point?" If your opponent volleys and/or obstructs the ball whilst it's still travelling over the playing surface, you win the point. But if the ball has already passed over the playing surface and it's obviously not going to hit the table, your opponent wins the point. In other words, if there's a chance that the ball might hit the table tennis table because it's still travelling towards it, your opponent would lose the point if he prevented it from doing so by volleying and/or obstructing it. If the ball has already passed over the table and/or is travelling away from the table, your opponent wins the point whether he volleys and/or obstructs it or not. Don't forget ... as well as hitting the ball with your racket, if you touch the ball with any part of your body or with anything you carry, the same rule applies. And this isn't tennis or volleyball! It's also worth noting that, despite all the subtle changes to this rule, it has never been legal to volley the ball in table tennis like you can when playing tennis. And it has never been legal to "spike" the ball and then play a shot as you can in volleyball either. 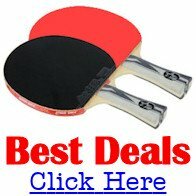 So why did this table tennis rule change in the 1990s? 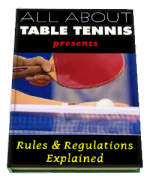 This rule was changed several times during the 1990s by the International Table Tennis Federation because it was recognised that the original wording of this rule was very unfair. However, it took several different variations to the wording of this rule before the current version was finally implemented in 2000. Under the old table tennis rule, a player volleying the ball at any time lost the point - which was particularly unfair in certain situations. For example, if your opponent played a really bad shot and the ball didn't hit the table but hit you instead (because you were unable to get out of the way in time), you would still lose the point. Under the current rule, the intention now is that a player will only be penalised if he intercepts the ball in a way that is likely to prevent an opponent from making a good return. A player therefore no longer causes an "obstruction" if the interception occurs when the ball has already passed beyond his end line, or has passed outwards over the sideline or is otherwise moving away from the playing surface. A much more sensible rule!